I do yoga, try to meditate, own a lot of crystals, love the moon, and believe in the power of the universe. It’s kind of a cliche… but these days, you don’t have to be an avocado eating, unicorn loving bohemian to be spiritual. If you search any of these hashtags on Instgram, there does seem to be a mystical movement going on alongside the clean living/eating trend. Being healthy and in touch with your true self, and your environment has a lot to do with nature. One way people can connect is through through the Earth’s natural resources – plants, flowers, and crystals. The crystals hold properties that vibrate and resonate to frequencies that can help with healing and aligning the chakras. They have been used for centuries, and today, even celebrities such as Victoria Bekham, and Miranda Kerr carry them. Every crystal has a vibration that works with your own chemistry to help restore your body’s highest potential, so if you apply this healing power to skincare, there’s magic there that would probably turn the most sceptical people into believers. I discovered Suti Skincare in Whole Foods a few months ago through organic skincare specialist Donna Ryan. 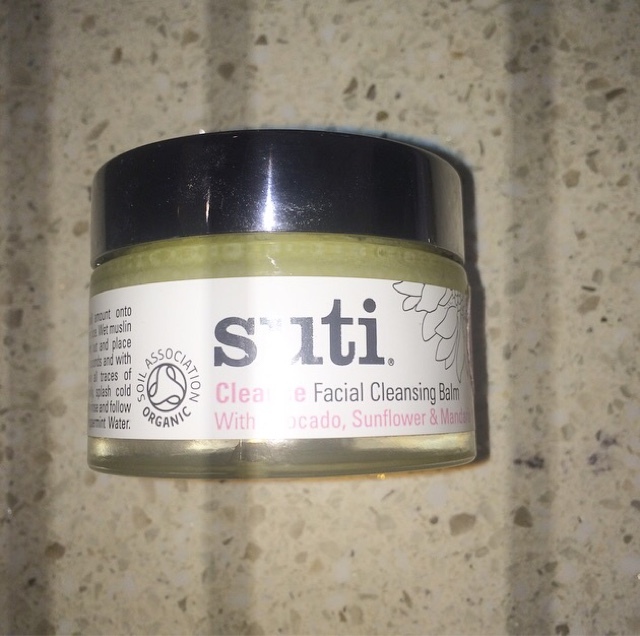 Suti Skincare is a British Organic Skincare brand based on Energy Healing. Each ingredient is carefully selected for its unique, nourishing, and energetic properties to help improve,refine the appearance and feel of your skin. The range contains the finest organic essential oils, while working the energy of Reiki, crystals, the moon cycle and flower essences. They have dedicated Clear Quartz Crystals that work specifically with each product. Physically Clear Quartz Crystal has a high silica content, which is fundamental to skin, energetically it works with the whole body, reputed to purify, amplify and send healing to where it is needed. Donna reccomended I try two of their products, Nourish Face Oil for Night (£39) and the Facial Cleansing Balm (£33). The Organic Face Oil contains Avacado Oil, Macadamia Nut Oil, Jasmine and Patchouli to heal, replenish and rehydrate the skin. Also, Macadamia and Geranium balance the production of sebum for a healthy glow, Argan oil calms, and Apricot Kernel promotes elasticity. The Energetic Intuition of this oil is ‘Stillness’ as it creates balance for rest, release, and renew, promoting skin to transform as you sleep. The flower associated to this oil is Jasmine, the Goddess of the night sky which like your skin, illuminates the darkness. I found this product to be really intense and thick compared to other night oils I have used from other brands. It does blend in easily, and leaves the skin feeling nourished and soft. It takes a while to get used to because the smell is quite strong, but the benefit is that you don’t need much, just a couple of drops will cover your entire face and neck. 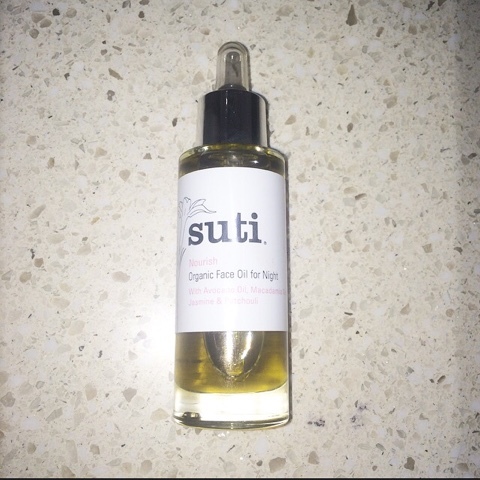 I started using this at the same time as another oil and I could feel and see the difference in the Suti one in quite a dramatic way – the Suti face oil leaves skin looking and feeling amazing. The oil makes skin glowy, soft, and youthful. I also noticed how good it was compared to other leading organic brands once it ran out, my skin hasn’t looked the same since. The Facial Cleansing Balm’s Energetic Intention is ‘Purification’ for release and renewal. This stuff is insane! The smell is so intoxicatingly good, I got a little obsessed by it. Every time I used it I would have to inhale it before I applied it like some sort of sick junkie! 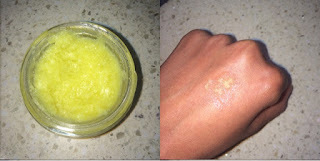 It contains Lime, Geranium, Avacado, Sunflower and Apricot Kernal Oil. The texture, as you can see below is thick and lumpy, but once applied to the skin, it rapidly melts and glides on, easily removing all traces of makeup – even black eye makeup. If I had to choose between these two products, I would definitely go with the cleansing balm as its unlike anything I have used before. It feels home made, yet the results are really powerful. The Avacado, Apricot Kernal, Sunflower, and Shea Butter intensively nourish, protect and replenish as well as removing dead skin cells. The Olive Oil smooths and calms inflammation, as well as tightening pores. I would highly reccomend Suti Skincare as its mostly organic, and has a romantic/mystical ethos behind it. If you don’t believe in any of the magic, and hippy stuff, I still think you should try it out anyway, as the products I used do what they say on the tin – they smell great, feel good and make you look healthy and glow. I feel like I haven’t even covered half of what they do as I needed to keep my word count down. Check them out and let me know what you think.